“Meh” is the online equivalent of saying to someone’s face “whatever!” or my favorite variants, “whatevs” or the silent “W” formed with your thumbs and index fingers. The Daily Show correspondent John Hodgman complained about it on Twitter last week, claiming that it represents that the user has “missed the point,” or worse — rejects joy! So of course, people responded to this Tweet with (drumroll): “Meh.” Hahaha. “Meh” has been traced back to two Simpsons episodes in which Lisa and Bart express their disdain for something their parents did. It’s an official word now, “meh” haters, so get used to it. It’s now in the Collins English Dictionary! 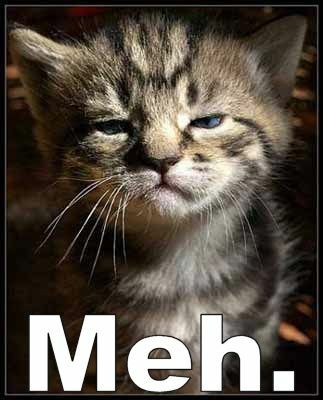 Tags: i say meh all the time, i think it's a fantastic word, the big bruhaha over the word "meh"